As the Harringtons have settled into Laramie/Wyoming/American life, they have been blessed to re-enter life and relationships with all the fantastic people they left behind in 2010. However, each day has also reminded the couple just how deeply they were incorporated into Korean life and community and how that place of their hearts and souls is adjusting and aching and wanting to be as full as it was just a few short months ago. Fortunately, the inconvenience of miles and time-zones has only stifled the frequency of interactions and reminders of Korea and the Harrington's Korea family. Smart phones have brought the Harringtons numerous reminders of faces and places the couple loves. These reminders are a sure fire way to bring a smile to the faces of the Harringtons if not a few tears to their eyes. Not only do beautiful reminders of life 'over-there' show up via Kakao Talk, but they were ready and waiting for the Harringtons here in Laramie as well. 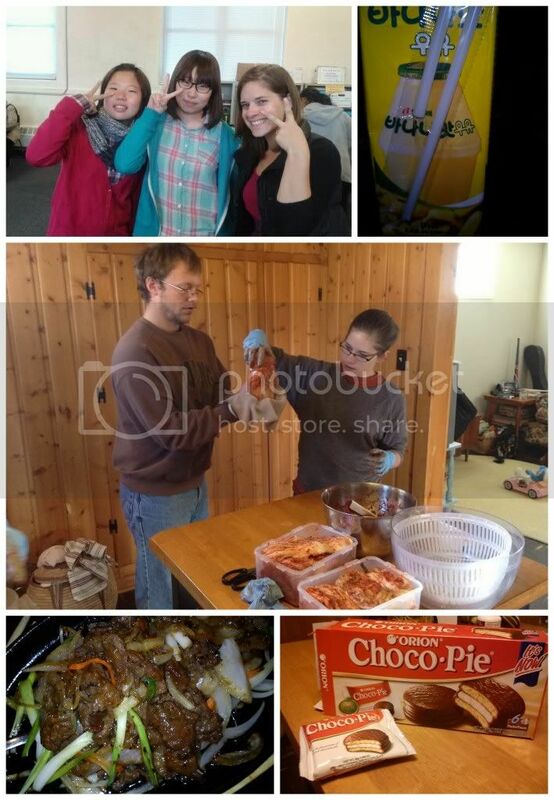 A handful of Korean middle school students, a Korean-Japanese restaurant ran by a sweet Korean family who understands our love of their foods and traditions, gifts of choco-pie from parents of Korean students and a Korean grocer a few hours away are enough to bring ease to the Harrington's hearts. These are the ways the Harringtons remember and remain connected. The way they honor where they have been and who they've shared life with. The way the thrive in a land that feels more foreign than it ever was and than it has any right to. The way they move confidently forward, aware that forever and for-always their hearts will beat in two places. Love this. :) Hoping these reminders and pieces of Korea follow you always to help the half of your heart that beats halfway across the world. That is so sweet of you. I like how men can be so sweet and at the same time mean to their lovely girls.